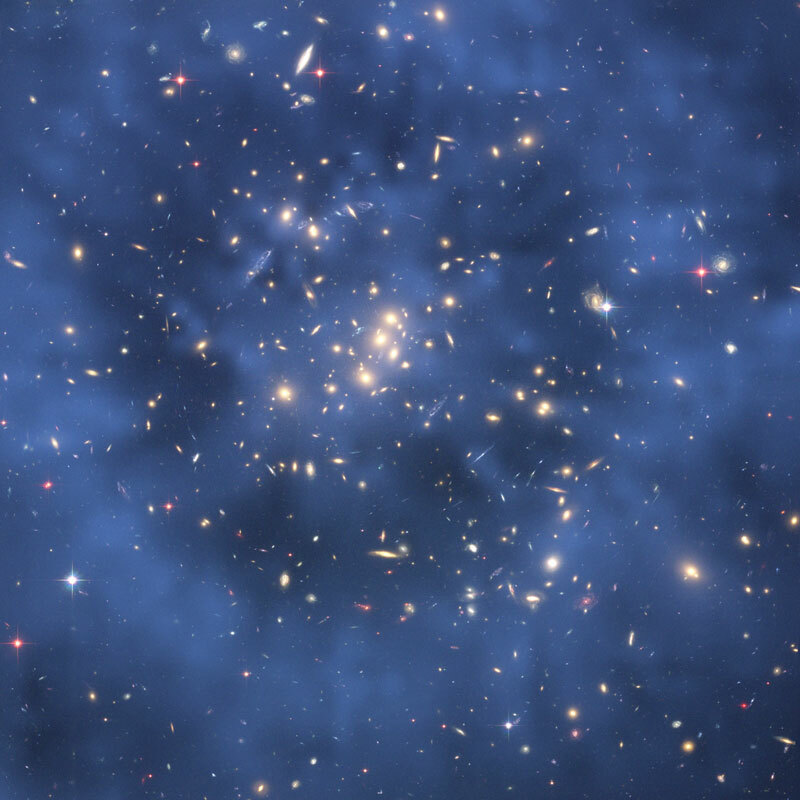 the vast structure of recollection. 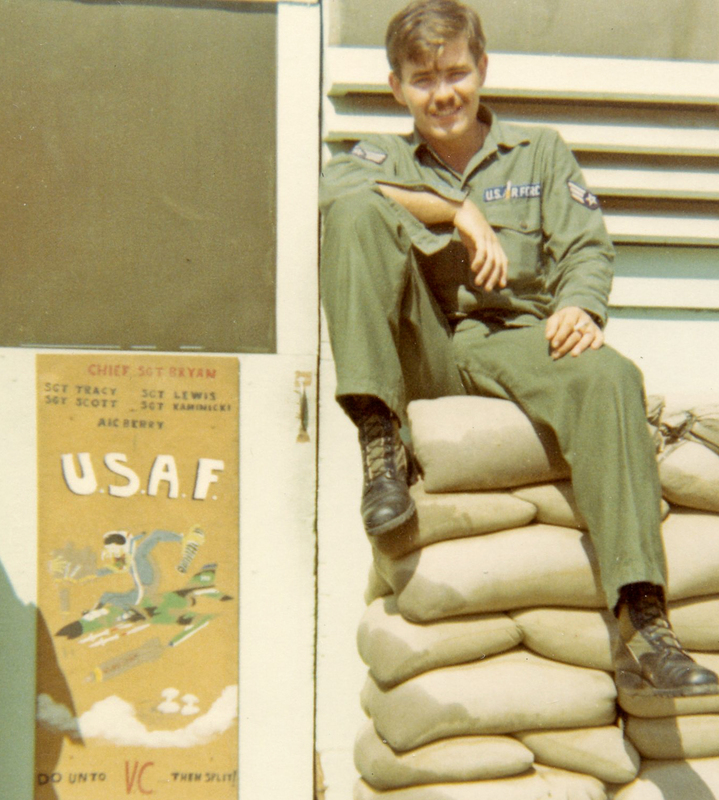 It was the spring of 1966, and I was a 19-year-old Airman stationed at Sheppard Air Force Base. My $117.90 military pay each month didn’t support my appetites — car, gas, beer, drive-in movies and burgers — so I had a part-time job at the big Texaco just south of town. A couple of nights a week pumping gas and checking oil doubled my income, taught me unsavory aspects of auto maintenance as business and kept me out of mischief. After all, I had a girl back home. In the Air Force, 1967. A lot of young guys who go into the military leave girlfriends behind. In defiance of the “dear john letter” cliché, they expect the relationships will last. They rarely do from all I’ve seen. People move on. But memories persist, especially mine, like that “…vast structure of recollection” Proust mentions. As a friend once told me, “You remember everything, and you remember EVERYTHING.” While my heart left Candy Williams in a pile of ash behind the Texaco in 1966, my head still bears the weight of it all. Volkswagen van for their southward trek to Stony Mountain. We were there the same week that year. The classic summer romance bloomed, but this one persisted into the fall, and then the winter beyond. With neither car nor money, I would walk and hitchhike the 200 miles to her house where her parents let me sleep on the sofa for the weekend. I did a lot of walking in those days. During the week, we kept the post office busy with letters back and forth. 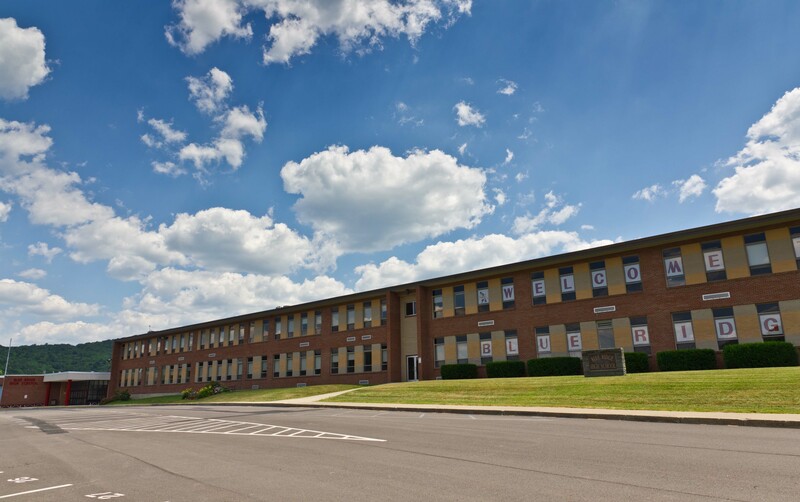 Blue Ridge High School. This is the parking lot where we parted in March, 1965. By late March, 1965, I had failed at high school, family and seemingly society in general. I had dropped out of school and was headed for the military — a last resort for messed up 18-year-old kids! I spent a bittersweet last weekend of March with Candy at her house. On Monday morning, March 29, I rode with her on the school bus to Blue Ridge High School in New Milford, PA. In the parking lot, we parted. She went inside to finish her senior year. I walked off alone bound for Vietnam, a place I’d never heard of. Two days later I was in Texas dealing with military basic training. A year later I was burning pictures and letters behind a gas station in Texas. I’d gotten the word she was dating a guy in her town, a guy with a future even less promising than mine. So I didn’t wait for the dear john letter. The next year I was in Vietnam. The stream of time babbled on, and until the early nineties I never thought about Candy Williams much. Once in a while I’d wonder what ever happened to her. That’s when I took a business trip up to Oswego, NY and passed through Great Bend on Interstate 81. Curiosity got me off the big highway for a look around at the place where teenage memories were made. I retraced the several miles I’d walked on back roads to her house after a hitchhiking ride had dropped me from the Interstate so many years before. I had coffee in the large diner that had replaced a tiny diner where Candy and I would sit together in a booth with cups of coffee and chocolate ice cream in little stainless steel cups. I drove slowly past her grandparents’ home in Great Bend where we spent Thanksgiving day in 1964. It all looked familiar, yet different. Nothing is the same even as yesterday, let alone 30 years ago. I looked at the parking lot of the high school where we parted that spring morning in 1965, and I measured my walk from there to the Interstate where I could start hitch-hiking home at three miles. It may not have been Proust’s smell and taste, but the visions triggered my relentless recollections. Over the next few days I thought about Candy Williams and that time past. Mostly I couldn’t get out of my head the image of a young man, all alone, walking down a back road in Pennsylvania looking for a ride with a stranger. His stated plans to achieve a GED and go to college after the military no doubt sounded whimsical to reasonable people. While I don’t remember feeling anything but optimistic as I walked that road, when I look back I am struck by the utter aloneness of that young man with the uncertain future, a blind naivety, and coming memories that would haunt like the persistent flames of love letters. This past summer I was on the road a few weeks. I steered a course for a couple of days around Great Bend, Pennsylvania. While I have no interest in romance I do feel a void in the strand of memory that went haywire in 1966. Loose ends from almost 50 years ago. Who knows why I care, but I do. What did Candy Williams do with her life? Marriage? Children? Work? What memories might she have of that time past? Are her parents and other family members still around? Does that place bear any witness to what we were or did? I decided this time to look around and maybe talk to some folks, sort of poking around the edges of recollection. So, it hadn’t taken long for things to start changing. Our tiny diner was gone within two years. Dobbs Country Kitchen, July 2011. 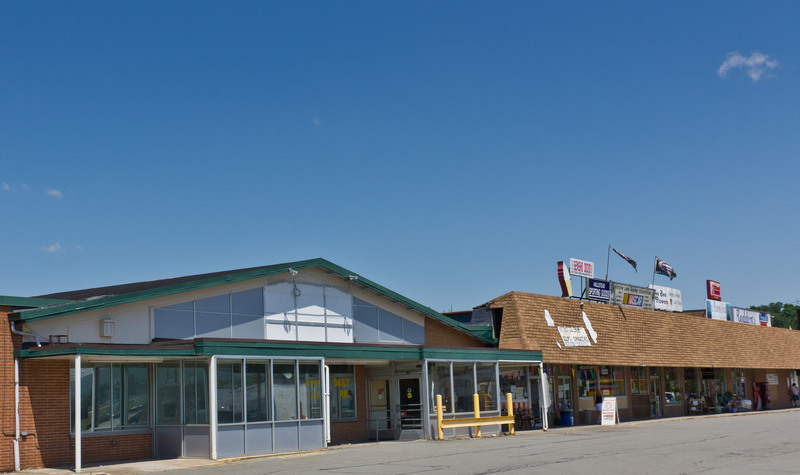 A shopping center behind the diner had been anchored by a grand Western Auto store in 1965. It’s now a dreary strip of old, tired stores. What had been the Western Auto apparently was a supermarket until a couple of years ago; it looks like it’s been empty a year or two now. In a sporting goods store, I talked with the owners. They had recently moved there to escape an urban environment. They knew little of what the place was like 50 years ago. I tried to find the old house where Candy and her family lived. It was a couple of miles back in the hills over dirt roads amid pastures and woods, and when I was there 20 years ago I did find it. No luck this time. Maybe the last decade’s housing “boom” got new houses built back there, but nothing looked familiar. Vehicles parked in driveways now are shiny SUVs; they used to be old pickup trucks. Blue Ridge High School doesn’t look any different than I remembered it in 1965. Even the parking lot where we got off the school bus looked the same as I remember it. There was no great inspiration or any flood of feeling. Institutions are meant to seem timeless and rarely show much age. I took pictures and went on. This is what remains today of what was a modern Western Auto store and shopping center in 1965. I came across a man named Williams. Being 70 and having lived his life there he did remember a lot. But he said all the Williams in his family had died or moved away. It felt comforting, even reassuring to talk with someone with a connection to that time. He knew of the tiny diner from 1965. He called it that “little tin can.” He agreed the people working in the current diner know nothing of the area’s history. “They don’t know anything — and they don’t care,” he said with more than a hint of exasperation. He knew the Interstate was locally called the PennCan Highway, since it was built to go from Pennsylvania to Canada. 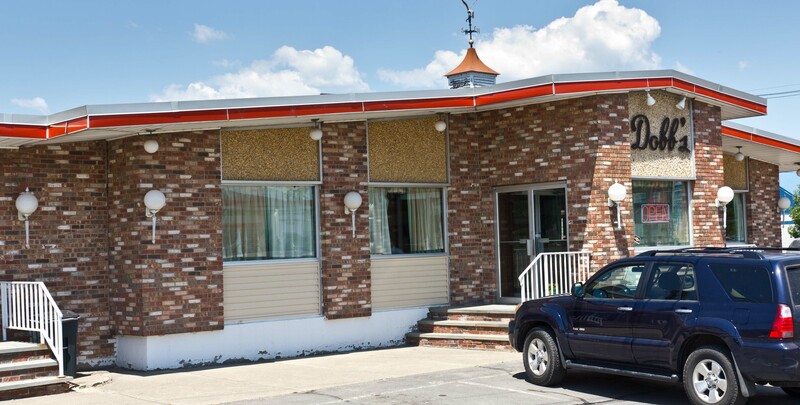 He knew it was always big news so many years ago when “there was a wreck up on the PennCan.” Gory details passed over phone lines and CB radio, among neighbors at the Western Auto and the diner — small town news. He even remembered Civil Air Patrol functions for kids who liked airplanes. But he knew nothing of Candy Williams or her father, Jack, or that family. 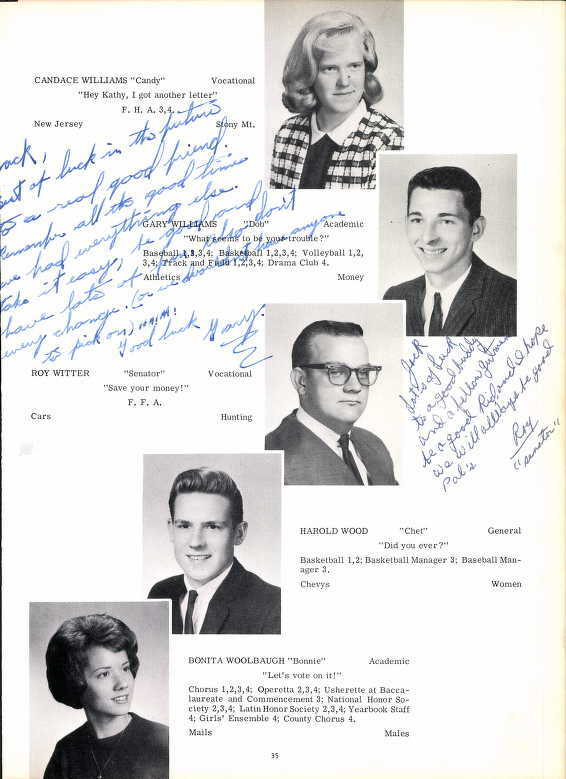 The Blue Ridge High School 1965 Yearbook page showing Candy Williams. That seems to have been the sum total of her senior year. Youthful devotion, anticipation and excitement ended ignominiously a year later in flames behind the Texaco. It makes me feel sad now, perhaps sadder than I felt in 1966. It makes me think of the loss of innocence and bleak disappointment in The Last Picture Show, a movie filmed 20 miles south of Wichita Falls in Archer City just five years later. My last stop was 40 miles down the road. I visited with Phil Hoff. His parents owned Stony Mountain Campground in the sixties. He and I are the same age, and we became friends in those days. Candy had a sister, Cindy, and the four of us were always together when I was in the area. I thought Phil might know something of what happened to the Williams family through the years. Sadly, he hadn’t thought about them in years. But then, he’d gotten married, had a family and built a business over all those years. Too busy to wonder after lost streams of time. Walt Whitman says it all for me in his poem, When I Heard the Learn’d Astronomer. Surely the life of Candy Williams is among those stars. And that’s enough. I know its a popular name and I’m not sure how old you are but I thought maybe it could be her? I lived in Great Bend from 1961 until 1979 when I graduated from Blue Ridge High School. I ran across your story while looking up nostalgia from my past in Great Bend. I am a few years younger than you; however if you have not found you beloved Candy, I am sure that I can find someone who knew her. My family has a long history in Great Bend and most of my relatives still live in the area. He found me, but thank you for offering! That was very thoughtful of you. I lived in Great Bend/Hallstead/GB Township area from 1959 until 1991. I probably knew or knew of yous family! It is totally amazing the things one finds on the web when stealing a minute away from other concerns. I stumbled on this well written and enjoyable story some time ago and rediscovered it today. Surprising, perhaps not so much, the experiences and feeling that are expressed are so similar to mine. The kicker is, Candy in the story is my first girlfriend and the first girl I kissed. My family left the Great Bend Hallstead area in 1961 though Candy and I had gone separate ways about a year before. I have been many places in the world during 40 years in the military, but the Hallstead Great Bend area is what I think of as home. Would I like to return? Yes! But only time will tell. There is still so much to do before I rest.